Lot 76. Macedonian Kingdom. Alexander III 'the Great'. 336-323 B.C. AR drachm (17 mm, 4.23 g, 12 h). Kolophon, ca. 310-301 B.C. 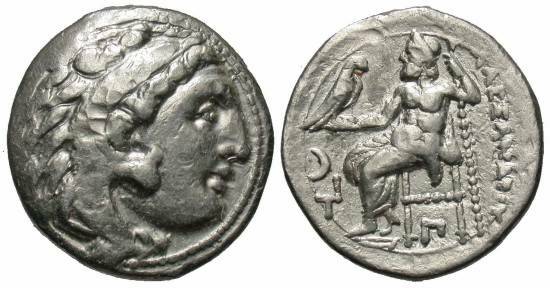 Head of Herakles right, wearing lion's skin headdress / ΑΛΕΞΑΝΔΡΟΥ, Zeus seated left, holding eagle and scepter; in left field, crescent above monogram; below throne, Π. Price 1809. Very fine.